Apologies for the delayed response it has been a busy week at work andnot much time for toys! I had a look at the ignition, running the standard motoplat ignition. I Changed the spark plug cap and trimmed back the plug lead, tried kicking it again by no joy. I check the plug after and still not much fuel on the end of the plug so Im assuming maybe not enough fuel? I am priming the carby, until it comes out the overflow hoses. I have since taken off the head and discovered that the piston is a little worse for wear. When I get a chance I will upload some pics. When you prime it/tickle it flick throttle open a few times while doing it and let it really flood out the hoses. Then hold it on about 1/4 throttle and kick with the decomp held in. Helps to have the bike facing down hill as well. If that doesn't work make sure the carb is clean and passages are clear. 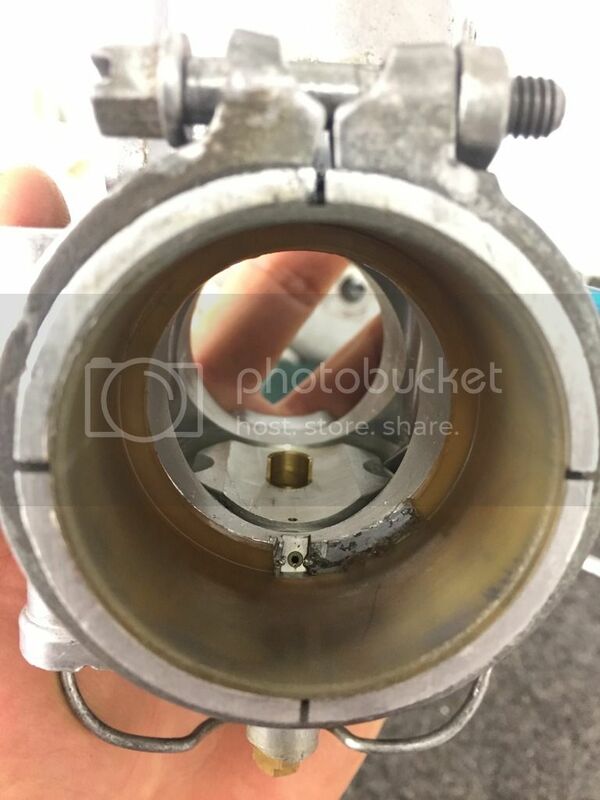 Also check that the nylon sleeve over the barrel intake spigot is fitted correctly, there is a notch in it's face that needs to be down to allow the idle passage of the Bing carb to be open. 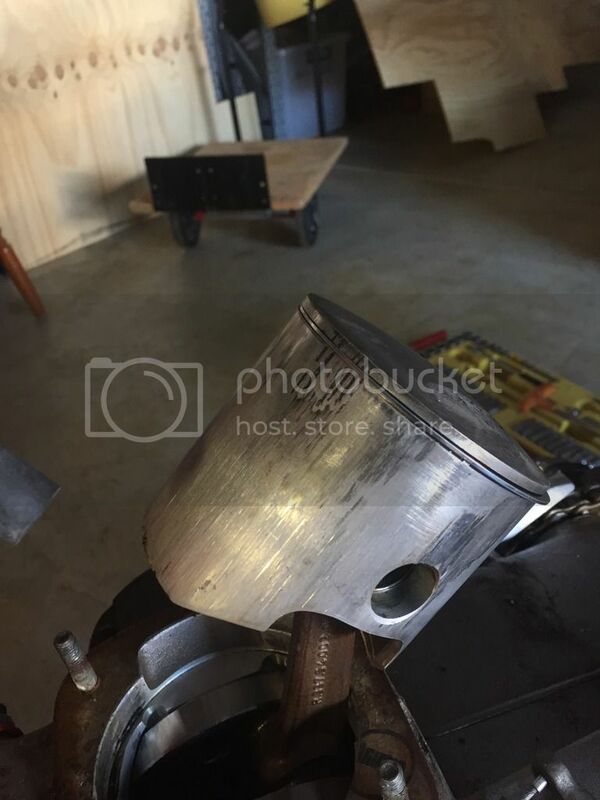 Being a little down on compression normally makes them easier to start but if the piston is really bad it could be a problem, you would fell the lack of compression kicking over. Thanks for all your replies fellas, much appreciated! "PezBERG" I have seen the bike running via a video the seller sent me . He told me that the bike had been rebuilt by the previous owner and that he had not ridden the bike due to ACL injuries and the inability to start the bike, the however the state of the piston indicates that it has done some time and looking very unhealthy (see pic). I'm not saying that this is entirely the reason for it not starting but now that I have the head off I might as well freshen the top end up. "Paul" no she hasn't sounded lively at all, so lacking either fuel or spark. Originally I thought it was a lack of fuel as the plug was not wet and so I swapped out carbys with the old mans 490 and still no joy. Spark was there but not as intense as I thought it should be, hence why I then thought maybe spark? "80-85 Husky" Funny you mention about the exhaust. When I was removing the exhaust I discovered a heap of fuel inside of it along with what I assume to be water/moisture (see pic). Following "sleepy" throttle technique, a fresh piston the old girl should start, yea?? . Just running the standard bing carby "sleepy"! Would like to continue troubleshooting before swapping ignitions, but if I continue to have no joy this will be my last resort. "KTM47" I am in Perth. If you are looking at the motor check the bigend for play and the main bearings. Like I said if it has got spark it should at least push start, but maybe the motor is too worn. Lots of Maico parts available. Maico @ Chippys is your man in Australia. Google him. Perth. I was going to suggest to bring it over and I could take a look but since I'm in Brisbane!! Is the piston ring still free in the groove the whole way around? I have seen piston that look worse than that and the motors still run but if the ring is jammed in the groove it may not have enough compression. Its a wounder it has any compression. 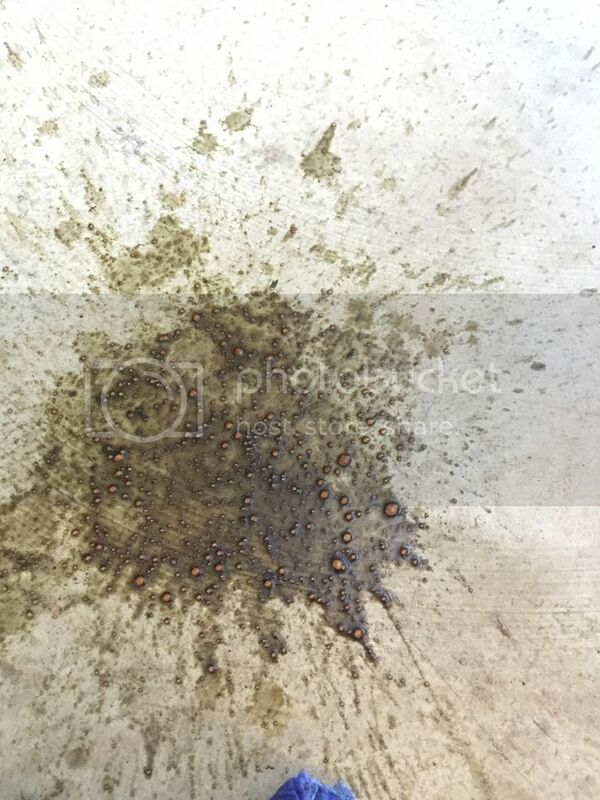 It looks like it has had no Oil in the fuel and Dirt and Dust has gone though the Engine. Also water has been in the crankcase. This means the crank pin and rod is most likely pitted/rusted. Best do a full rebuild. Top end, Rod Kit and all bearings, including gear box. Do not forget the Primary chains. Try to test the ignition on another bike. When I prime the carby fuel continues to flow out the vent pipes and bottom of the bowl, would this suggest a dodgy float seat? I did inspect the carby thoroughly and ensured that the floats ran parrell with the base of carb as per manual. The only damaged component I have discovered in the carb is the plastic intake sleeve (see pic). Any other suggestions? As you say Nebo Im prob best trying my ignition on another bike. All i want to do is twist that throttle on and ride. Sick of seeing her in bits and covered in fuel. Float needle and seat could be a bit worn but my money would be on contamination coming out of the tank. Do you have a filter in the fuel line to the carb? The plastic won't cause any issue just make sure that the idle passage remains clear. Get yourself a timing light on the plug lead and watch for a flash while kicking. Try with the plug out first to check the timing light is functioning then put the plug back in and kick. If no flash you have found the problem. With the plug out there is no pressure which reduces the voltage to jump the gap also plug out kicking is much higher kick speed so seeing a spark with the plug out is no guarantee of a spark with plug in. Makes Perfect sense sleepy! I will do that and see how I go. Thanks for the prompt response. Is the fuel coming out of the over flow hose or around the bowl. The cork gasket will leak if it gets old and dry. HI. I agree with Sleepy and KTM 47. Float Needle is most likly worn. This Critical in a Bing Carb. Also the Float pin should be replaced . As groves in pin can give a false reading of the Float level. Use Motel 800 at 32 : 1. Run in with at least 4 Heat Cycles. Jetting with modern fuel. 50 Pilot Main 190/195. 98 octane. Broken Plastic addaptor In carb. replace it. May Cause Air Leak. So I purchased a timing light, with a positive result. So I have spark. I therefore swapped carby over with the old mans carby (incl slide and neeedle). Kick, kick, kick, kick.... nothing! I checked the plug and it smelt of fuel but wasn't dripping in fuel. Should I expect more fuel on plug? If a known working carby is installed i wouldve have assumed the fuel entering barrel Would've been sufficient. Is there anything strange that could be happening occurring between carby and barrel to be depriving barrel of fuel? My next step will be to swap over the ignition unit from my dads bike. Nebo, thanks mate. will have to purchase a carby rebuild kit. have you checked compression? big bores can feel like they have it but it may be low. Hi Hoony, yeah should have enough compression has a new top end and barrel has been honed to repair original wear.